With the onset of Cushion Compacts in the UK, after the release of the Lancome Miracle Cushion (I wonder if that was driven by Lisa Eldridge, I know that she really enjoys cosmetics and technology from Asia), I recently indulged in not only one, but two cushion compacts from Korean brands. 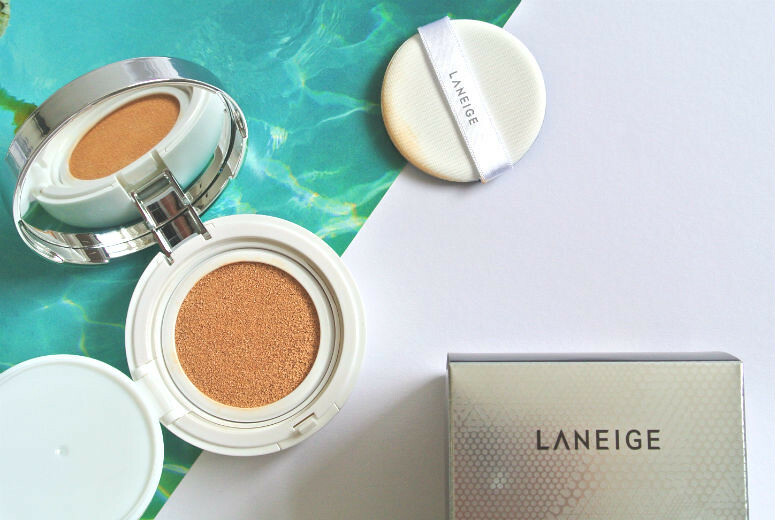 I've shown off my Hera UV Mist Cushion over on Instagram, but recently I picked up the Laneige BB Cushion Compact, and wanted to talk about that first. Cushion compacts have been a big thing in Korea, the birthplace of many recent beauty trends here in the West, for many years now, and the aim is to offer skin care with coverage while still imparting that all-important glow factor, which is a huge part of Korean skincare mentality. The packaging is the standard setup for a cushion compact, with a good sized mirror, a compartment with the bb-cream/foundation soaked sponge, and a lid over this compartment where the sponge can sit nicely in. It's a very solid compact, but if you are going to carry it around, I would advise dropping your bag with force if it's at the bottom. The bottom part can be pushed out, so that you can replace the sponge with a refill when you need to-a great idea in my opinion. I know that most of the time the applicators that come with makeup tends to be discarded or never used, but the sponge that comes with this compact is really good, being both dense but malleable enough to be pressed into the different nooks and 'corners' of your face. You just press the sponge into the cushion, which then picks up some product, and you press/dab/smooth onto your face. I personally find that pressing it in gives the best effect. With this kind of motion, I am able to get a nice amount of coverage, while still imparting some of that glowiness. In terms of coverage, I will be the first to admit it doesn't hide all my blemishes. If you want to try this one out, you will definitely need concealer if you have any spots or scars. It gives a buildable light to medium coverage. I would say that it reminds me of a slightly less covering NARS Tinted Moisturiser. What I really like about this product, aside from the fact it's so portable, is that it came with a refill, so once this one has dried out, I have one already spare inside a sealed package, ready to pop in. This is unlike the Lancome version that we have easier access to, which is £29.50 for the initial pack, and £19.50 for a refill. The Laneige BB cream has SPF 50 in, so it's probably best to avoid flash photography when wearing this. Shade wise, you might be a bit stuck as there are only 2 shades in the range I bought, but then this is because Korean skin tends to be very fair to medium. I have the shade No 21 in Natural Beige. If you want to try Cushion Compacts and you have darker skin, I would say that Lancome's version might be your best bet. I ordered mine through eBay (the seller has a physical store as well as through eBay), but you can order yours from YesStyle.